Paul Monopoli takes a look back at the very first video game, and its influence on what would become one of the world’s most popular pasttimes. In 1961 the Massachusetts Institute of Technology was to receive the next advancement in computer technology. Already home to the monstrous TX-0 computer, its successor, the PDP-1 was a more compact machine, capable of everything the TX-0 could do and more. Both computers sat side by side in the institute’s computer lab, but enthusiasts tended to gravitate to the newer technology of the PDP-1. Prior to the arrival of this new advancement in technology, the institute needed to look at what they would do with it. A small committee was formed to consider their options, and what could be done to show off the hardware. It was Dartmouth graduate Steve Russell who came up with the answer. Russell, known as ‘Slug’ for reasons that are unclear to him, came up with the concept of a piece of software that would push the technology to its limits, and be of interest to casual onlookers. Steve was a fan of science fiction and space was the hot topic of the day. With the US aiming their sights to the sky it seemed like a natural choice for their first video game. Before development on the game could begin Steve led his committee through the process of designing what was already known as ‘Spacewar’. It was decided that the game would involve two space ships known as ‘The Needle’ and ‘The Wedge’, battling among the stars. Death would come to those who were hit by their opponent’s missile or one of the surrounding stars. The centre of the game screen featured a gravity well that the ships could use to manoeuvre themselves to escape potential death. Those who found themselves in an inescapable situation could use the hyperspace button to make their ship disappear and reappear at a random part of the screen. With the rules in place Steve led his team through the arduous task of coding the game. As the PDP-1 was a bare bones computer with few commands available, hackers converted and improved some of the existing code from the TX-0 to avoid having to completely start from scratch. With a set of commands ready to go and a paper tape (the media used by the PDP-1) full of the math routines needed it was ready to begin working on graphics. The TX-0 was already home to several graphical applications, that while crude by today’s standards were impressive for the time. Bouncing Ball was a simple dot that bounced up and down, making a noise as the dot hit the ground. This led the way for a Tic Tac Toe simulator, Mouse in the Maze and HAX, which all used different styles of graphics. First manufactured in 1959, Digital Equipment Corporation (DEC)’s PDP-1 (Programmed Data Processor-1) was based on MIT’s TX-0 (Transistorised Experimental Computer Zero, but known as Tixo). Built over 1955-56, Tixo had a huge amount of memory (64K!) for the time, while fitting inside a reasonably-sized room. MIT ran into difficulty building a successor to Tixo when several of the members on that team left to start DEC, whose first major commercial product was the PDP-1. They donated the prototype to MIT. In addition, the PDP-1 supported a video display, the Type 30 (shown on previous page), which was a hybrid between vector and raster displays called a “dot plotter”. The electron beam was programatically moved to any position on a 1024×1024 grid and fired, creating a dot. Spacewar was developed using the Type 30. According to an interview in Creative Computing August 1981 Steve claims that increasing the size of the graphics from a dot to a ship was relatively easy. The outline of each ship starts at the tip and using directional codes the outline is created. These codes adjust depending on the direction the ship is facing, and pre-planning in the code helped to determine the next step. If the tip of the spaceship points downwards the directional codes would determine five possible adjacent dots that could be displayed next. While the team wrestled with the mechanics of the game, earlier code was used where possible. A graphical demo called ‘Minskytron’ contained code that was used to help the ships orbit around the centre point. Even with this advantage the team struggled to map these orbits to the player’s controls. While it was a technical marvel at the time, Steve found the methods used too constricting. As a means of rotating the whole grid he added a sine and cosine to the existing code, cutting down the calculations needed for each display frame. There was provision for different shapes to be used in the code, but the game would slow down for each new item added. Upon release the game became so addictive that the university had to impose restrictions on when the game could be played. This level of success didn’t prevent up and coming coders from making their own modifications to the game. The game spread across to other PDP-1 computers at other universities, with students modifying it in ways that they felt would improve the gameplay. Most of the original development team parted ways shortly after the game was complete but their mark on the world had been made. While video games were still far from being a cultural phenomenon, the way they captivate an audience and draw them in had been noticed by those who played Spacewar. It is said that imitation is the sincerest form of flattery, though there are plenty of lawsuits that would argue this. With no legal protection in place many others attempted to replicate the success of Spacewar by releasing their own versions of the game. Nolan Bushnell, who was a fan of the game, developed ‘Computer Space’, the first commercial version of the Spacewar. However, it was Larry Rosenthal who would introduce the gaming world to real vector graphics in his own attempt to bring the game to the masses. Larry had seen Spacewar at MIT and knew that he had to own the game. He based his Masters thesis on developing a simple, cheap hardware platform that could run the game, and even improve upon it. Using off the shelf parts Larry successfully created his clone using a custom TTL processor. The way in which Larry decided to do the graphics was very different to the earlier raster based Spacewar. Other Spacewar clones had all used a method of turning pixels on and off to create the illusion of the spaceship moving through space. The process was slow and clunky, and Larry knew he could find a more efficient way of making it work. Using a vector beam to draw graphics, Larry used complete lines to create polygons which formed the shape of the ships. The vector graphics used a start and end point which would define where the lines were drawn on the screen. Other points can be used along those lines to create curves. Where the code for Spacewar would tell the computer where to put each pixel on a grid, the vector graphics used in Space Wars described how the image was to be drawn and the computer would follow the instructions given. Unlike Spacewar, Larry’s game allowed for variations in gameplay. The amount of ammunition, the speed of the spaceships and the level of gravitational intensity could all be modified depending on the needs of the operator. The game contained no artificial intelligence, and as a result was two player only. The prototype was coded on a 16 button keyboard and fit into a suitcase. With the hardware developed Larry felt it was good enough to be released to the public, so he set about carrying his suitcase to various offices. Atari were a forward thinking company who saw a future in video games, so they were approached. Larry spoke to Nolan Bushnell who quickly turned him down. Nolan’s own Spacewar clone, Computer Space, had not been the big big success story that Atari were looking for. Perhaps feeling sore from that experience or not seeing the benefit of having another clone on the market he passed on the project. Larry found hope in Cinematronics Incorporated. Founded in 1975 by Jim Pearce, Dennis Parte and Gary Garrison the business was created to cash in on the success of the arcade market. Atari had set the standard with heavy hitters like Pong, and Cinematronics were looking for their own success story. In Larry they saw the success they so strongly craved, but Larry had a price. He wanted to retain full ownership of the game and 50% of the profits (though Larry himself rejects that it was that much). Cinametronics were still relatively new on the scene and were far from the success story Atari had become. They agreed to Larry’s demands and Space Wars went into production. Initially Space Wars was released in two different cabinets. The most common release was an upright cabinet with light up marquee, which could often be found in the corner of a pub or club. Cinematronics also released a tabletop version of the game, with each player sitting on either side of the table. The game featured timed rounds, with the winner being the player who delivers the most kills in the time limit. Larry was riding high on the wave of success, and was making good money out of his creation. However, for the electronics whiz it wasn’t enough and he approached Cinematronics for more money. When they refused he decided to leave and setup a new business called Vectorbeam. As Larry still owned the rights to Space Wars Vectorbeam were also able to release the game alongside Cinematronics. Larry created his own smaller version of the cabinet with a superior screen and better quality shell. Cinematronics were in a difficult situation. Not only had Larry left the business, but he had also taken the only set of instructions for programming the CPU. No copies had ever been made, and Cinematronics were forced to reverse engineer the hardware before they could resume production. The bigger problem was that as per the original agreement they were obligated to keep paying Larry royalties for each machine they released. Deciding to seek retribution, Cinematronics took Larry to court. The matter was resolved out of court, and Larry was rumoured to be paid around $1 million for Vectorbeam and the rights to the hardware design. Cinematronics were now the only developers of Space Wars, and they continued to use vector graphics in other arcade releases. However, all of this activity was being observed by their closest competitor. A competitor who had earlier turned down Larry Rosenthal as he was shopping around for a distributor. In 1978 Atari was now in the hands of Warner Communications, though Nolan Bushnell was still with the company. 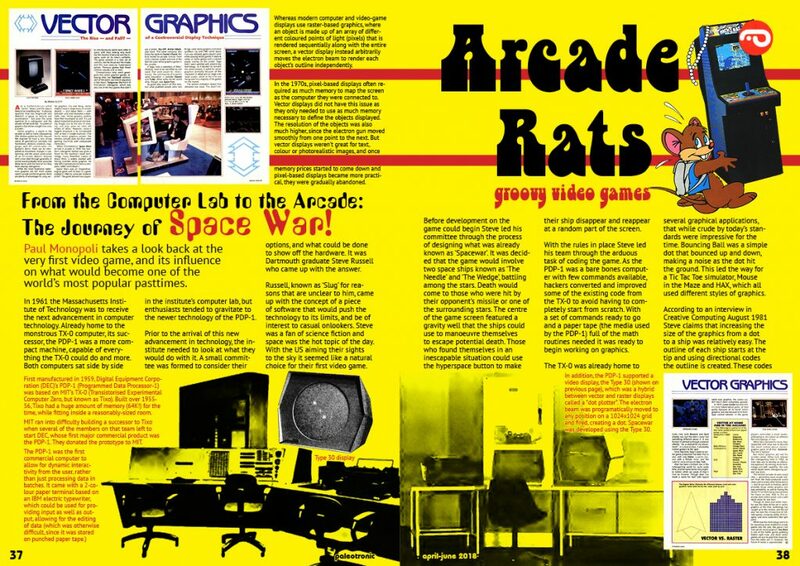 After seeing the success of Space Wars, Warner pushed Atari designers to develop games using vector graphics. Howard Delman pitched an idea for a game that required you to land a lunar landing module on the moon. The concept was hardly new idea, but using vector graphics similar to those found in Space Wars and with the Atari name behind it this version was set to be a success. Delman worked on the game with new Atari recruit, Rich Moore. Rich was a keen space enthusiast, having built models of lunar landing modules which he was younger. Howard was already aware at an earlier attempt at a similar landing game from 1969 called Moonlander, which itself used a vector display and a lightpen as a control method. Taking inspiration from this earlier title, as well as their own ideas the duo started work out of Grass Valley in 1978 after spending time experimenting with vector graphics. Howard already had a reputation as a jack-of-all-trades coder, and paired with Rich it was thought that the game could never be anything short than a success. Rich planned the game on graph paper, which he had to buy himself as Atari did not have any in stock. He used a paper and pencil method to plan the vectors, setting up the mountains using only his memory of the 1969 game as reference. Rich was ambitious, wanting craters to be left on the surface when a ship crashed. Unfortunately this would have added more lines to the graphical display, increasing the refresh rates and slowing the game down. Rich’s paper and pen graphics were converted into code, which was then entered in by two ladies who were fast typists. This code would be compiled and tested before revisions were made. The game was eventually released in an upright cabinet. A cocktail version was planned, though only two prototypes were made before the idea was cancelled. 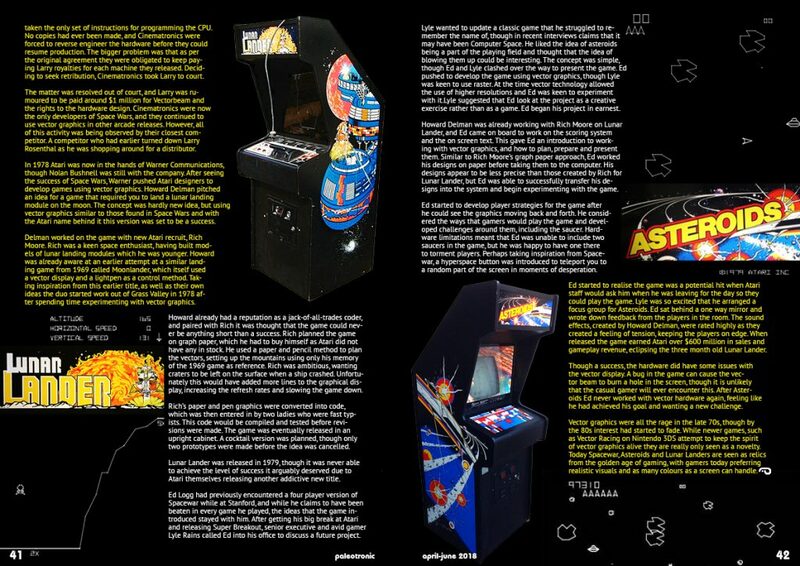 Lunar Lander was released in 1979, though it was never able to achieve the level of success it arguably deserved due to Atari themselves releasing another addictive new title. Ed Logg had previously encountered a four player version of Spacewar while at Stanford, and while he claims to have been beaten in every game he played, the ideas that the game introduced stayed with him. After getting his big break at Atari and releasing Super Breakout, senior executive and avid gamer Lyle Rains called Ed into his office to discuss a future project. Lyle wanted to update a classic game that he struggled to remember the name of, though in recent interviews claims that it may have been Computer Space. He liked the idea of asteroids being a part of the playing field and thought that the idea of blowing them up could be interesting. The concept was simple, though Ed and Lyle clashed over the way to present the game. Ed pushed to develop the game using vector graphics, though Lyle was keen to use raster. At the time vector technology allowed the use of higher resolutions and Ed was keen to experiment with it.Lyle suggested that Ed look at the project as a creative exercise rather than as a game. Ed began his project in earnest. Howard Delman was already working with Rich Moore on Lunar Lander, and Ed came on board to work on the scoring system and the on screen text. This gave Ed an introduction to working with vector graphics, and how to plan, prepare and present them. Similar to Rich Moore’s graph paper approach, Ed worked his designs on paper before taking them to the computer. His designs appear to be less precise than those created by Rich for Lunar Lander, but Ed was able to successfully transfer his designs into the system and begin experimenting with the game. Ed started to develop player strategies for the game after he could see the graphics moving back and forth. He considered the ways that gamers would play the game and developed challenges around them, including the saucer. Hardware limitations meant that Ed was unable to include two saucers in the game, but he was happy to have one there to torment players. Perhaps taking inspiration from Spacewar, a hyperspace button was introduced to teleport you to a random part of the screen in moments of desperation. Ed started to realise the game was a potential hit when Atari staff would ask him when he was leaving for the day so they could play the game. Lyle was so excited that he arranged a focus group for Asteroids. Ed sat behind a one way mirror and wrote down feedback from the players in the room. The sound effects, created by Howard Delman, were rated highly as they created a feeling of tension, keeping the players on edge. When released the game earned Atari over $600 million in sales and gameplay revenue, eclipsing the three month old Lunar Lander. Though a success, the hardware did have some issues with the vector display. A bug in the game can cause the vector beam to burn a hole in the screen, though it is unlikely that the casual gamer will ever encounter this. After Asteroids Ed never worked with vector hardware again, feeling like he had achieved his goal and wanting a new challenge. Vector graphics were all the rage in the late 70s, though by the 80s interest had started to fade. While newer games, such as Vector Racing on Nintendo 3DS attempt to keep the spirit of vector graphics alive they are really only seen as a novelty. Today Spacewar, Asteroids and Lunar Landers are seen as relics from the golden age of gaming, with gamers today preferring realistic visuals and as many colours as a screen can handle. In Spacewar, two ships do battle around a star, which exerts gravity on them. Each player can rotate their ship, fire missiles, apply thrusters and, in an emergency, “jump to hyperspace” which repositions their ship at a random location elsewhere on the screen (but half the time causes the ship to explode). The gravity effect is quite pronounced and the missiles move quite slowly, meaning that to win, a player must learn the game mechanics sufficiently to predict the eventual location of their enemy. The missiles, however, are not affected by gravity, as there wasn’t enough computing power left to calculate their trajectories! The game was initially controlled by switches on the PDP-1 console, but this was awkward (especially for one player) and an early “gamepad” was devised to eliminate this disadvantage. Spacewar would inspire a number of later games, including Computer Space and Asteroids. 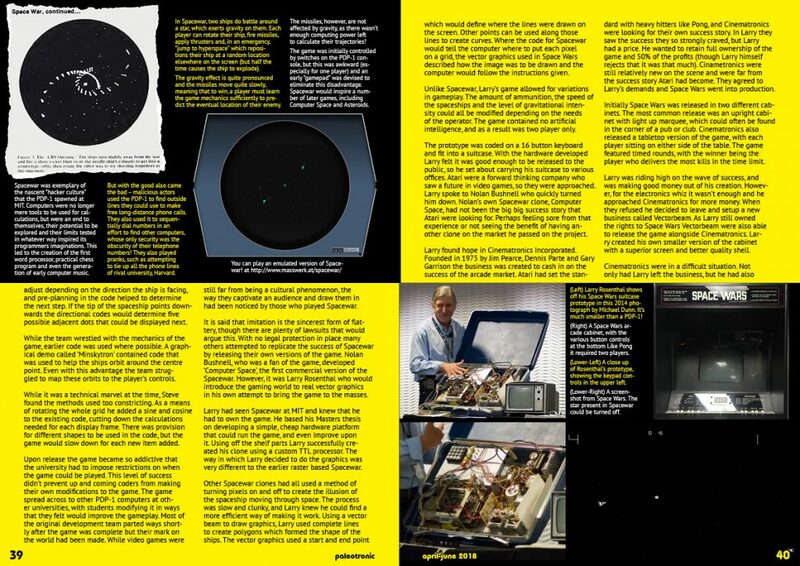 Spacewar was exemplary of the nascent “hacker culture” that the PDP-1 spawned at MIT. Computers were no longer mere tools to be used for calculations, but were an end to themselves, their potential to be explored and their limits tested in whatever way inspired its programmers imaginations. This led to the creation of the first word processor, practical chess program and even the generation of early computer music. But with the good also came the bad – malicious actors used the PDP-1 to find outside lines they could use to make free long-distance phone calls. They also used it to sequentially dial numbers in an effort to find other computers, whose only security was the obscurity of their telephone numbers! They also played pranks, such as attempting to tie up all the phone lines of rival university, Harvard.